Fadase Selvayn is a Dunmer trader who owns a shop in Tel Branora. She has an infinite supply of common, lesser, and petty soul gems. 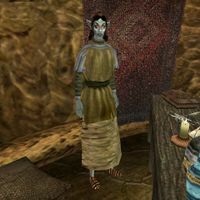 Fadase is the only merchant in the game with a restocking supply of soul gems, apart from Elbert Nermarc, who is added by the Tribunal expansion. Fadase may be related to Falas Selvayn. This page was last modified on 27 January 2015, at 04:11.